Sorry this post is out late, but I have a good reason, a sleepover with my daughter, Dayna. And uh, I think Rufus is in love with her. He's even not his usual 'holy terror in the morning' self...making a liar out of us! I was so pleased to see the ranks of squirrel chasers increase last month. You know you're out there! See the squirrel. Feel the squirrel. Be the squirrel! My favourite DrEAMi! linked up was this butterfly quilt by Janine at Quilts From the Little House. Isn't this quilt top just so gorgeous?! It's going to be a quilt for Hands2Help (click sidebar button for details). She had two more DrEAMi! projects in that same post, these three doll gowns for A Doll Like Me and a fabric bracelet her granddaughter, with her help, made. Head over to Bernie's blog, Needle & Foot, the blog that first alerted us to this good comfort cause, for all the details on making the doll gowns and/or doll quilts, as you can always help, even though the main drive was last year. I had a DrEAMi! project of my own this past month, a month where I can ill afford to be heading off in a tantalizing direction when I should be focused on the 'must-do because uh deadline?' projects. You can read about it here. 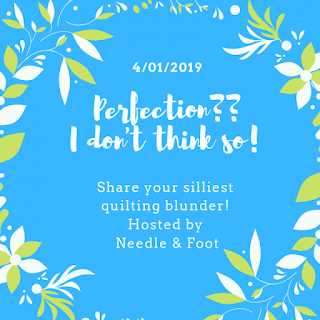 Link up below for those projects that derailed your regularly-scheduled quilting programme! And, I want to let you know of another great linky party that opens April 1 (how is it April??) at Needle & Foot. You can read about it here, but basically it's a linky for us to talk about and confess those times where, well we may have had an epic fail. None of us are perfect, and it's important to remember that. Also, something I've said and thought many a time, "Comparison is the thief of joy". Hope you'll join in the fun and honesty therein. 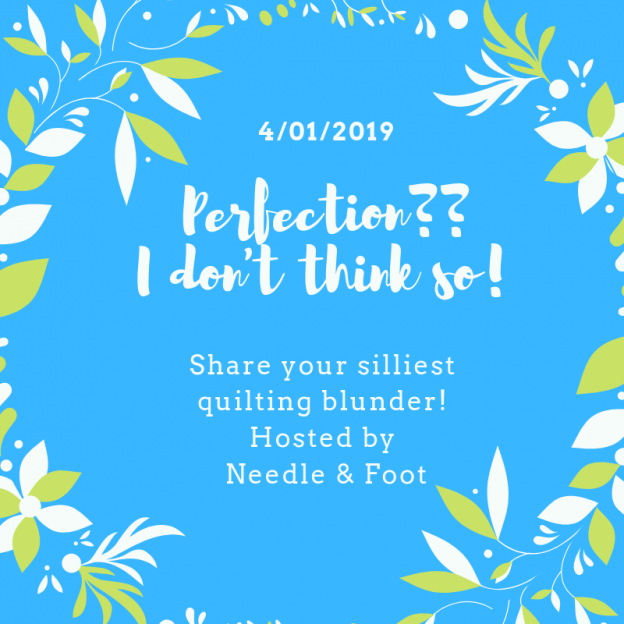 Much like our 'perfect lives' that blogs seem to show, which is so not the case, our quilts, too, are never perfect, and oh, yes, there are some epic or maybe not so epic, fails along the way. Enjoy your time with your daughter! And thanks for hosting us! Enjoying the derailment. Thank you for letting us share our squirrels and enjoying those of others. Oh, wow, that butterfly quilt is so pretty (and I'm not usually a butterfly fan)! So, when I was prepping my Purple Sage post I said to myself -- don't forget to make this your iDrEAM post. Did I remember??? No. Argh. I'm going to go edit and add your link and post it. Hope that's ok. Geez. Unfortunately right now I can’t chase the squirrels running around my sewing room! Two big commission projects with deadlines. Why is it there are always more squirrels when you’re too busy to chase them? My Dreami morphed into a new pattern and as such no reveal yet even though I do have it finished. Good luck Sandra on all of your projects. Sometimes a squirrel or DrEAMi! is exactly what you need to release some stress and have fun. Thanks for hosting. Aw, thanks for the recognition, Sandra! I’ve been away from social media (and sewing) pretty much all week, so this was fun to come home to. No DrEAMi here this month, but it will be fun to see what squirrel everyone else has been chasing.